The Slash Pine tree is a native of the Florida landscape. It normally grows on sandy, poorly drained flat wood soils. A wide variety of wildlife benefit from the Slash Pine. Eagles nest in its crown, and the Red Woodpecker excavates nests in older trees afflicted with red heart fungus. Growing straight and tall with a strong central leader, most trees have cone shaped crowns which are relatively small unless grown in the open. This is an excellent trees for giving the feeling of depth to plantings and for framing. Great when surrounded by bed of azaleas on large lots. Slash Pines can also be used to reap good returns at lumber sales. The slash pine tree (Pinus elliottii) is one of four southern yellow pines native to southeastern United States. Slash pine is also called southern pine, yellow slash pine, swamp pine, pitch pine, and Cuban pine. Slash pine, along with long leaf pine, is a commercially important pine tree and one of the most frequently planted timber species in North America. 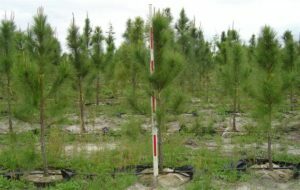 Because of its rapid growth rate, slash pine has great valuable for tree planting on timber plantations, especially in the southeastern United States. Slash pine supplies a large portion of the resin and turpentine produced in the United States. History suggests that the tree has produced most of the World’s oleoresin over the last two centuries. Slash pine is cultivated in warm climates worldwide for lumber and paper pulp. The excellent quality of lumber gives slash pine the name hard yellow pine. The pine is only rarely used as an ornamental landscape plant outside the deep South.Contact us today!